Because I am obsessed with all things wedding related at the moment and there was a new series coming on TLC, I had to tune in. The previews of the elaborate dresses were also intriguing. 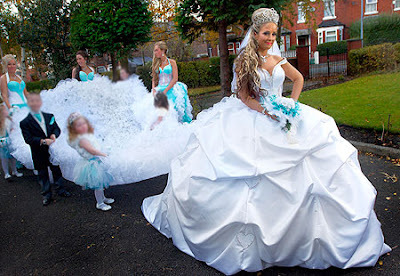 Although gypsies typically live in trailers, they have quite the lavish wedding celebration. 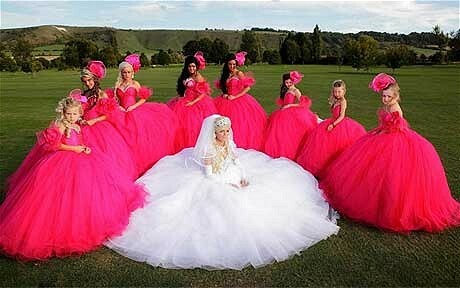 The dresses are ELABORATE, usually have a revealing top with a full skirt. 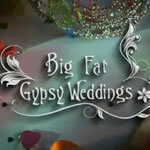 The most shocking thing to me about gypsies was the courting rituals. Girls cannot talk to boys first, especially alone or they are considered scandalous. Although they always wear raunchy clothing, the young women have high morals and aren't allowed to go on dates until they are married. Until they are engaged, the girls are subjected to something called grabbing. This is a courtship ritual in which the boys are trying to get the girl to kiss them. Unless the girl is highly interested, she rejects the kiss. Even if the grabbing becomes quite physical. 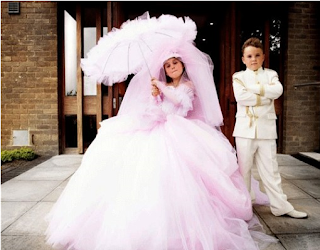 A girl's communion is another elaborate event for gypsies is considered a dress rehearsal for a girl's wedding. Here are a few pictures of the British Gypsies on their special day. ...this girl is 16. I can't believe she is wearing that! I can't believe how full that skirt is! Almost too short in the front. I wanted to see this SO bad, but unfortunately I worked late. I hope to see the next! I'm watching this right now! Crazy, crazy, crazy! It's like a train wreck you have to watch?! Btw...Terry and I decided you need to be at the next Conway event...we will have a girls night out at La Hureta and then go to the Pool! Wish you could have gone this weekend! I thought the shoe was absolutely ridic! plus I couldn't understand half of it, they need subtitles for the whole show not just some of it ! its crazy to be able to see how these people live, and i know now I never would want to be a gypsy! We watched some of this last night...it's just crazy! There's a gypsy community a couple of hours from us and it's crazy to drive by there! They have to live in small trailers even though they have huge houses built behind them! Haha, WOW! I was a little taken back by the show when I saw the previews and didn't watch it but it sounds kind of interesting! I may have to watch it next time it comes on.